The implementation of sound quantitative risk models is a vital concern for all financial institutions, and this trend has accelerated in recent years with regulatory processes such as Basel II. 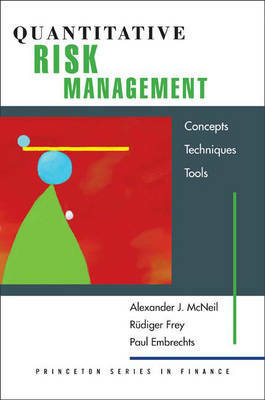 This book provides a comprehensive treatment of the theoretical concepts and modelling techniques of quantitative risk management and equips readers - whether financial risk analysts, actuaries, regulators, or students of quantitative finance - with practical tools to solve real-world problems. The authors cover methods for market, credit, and operational risk modelling; place standard industry approaches on a more formal footing; and describe recent developments that go beyond, and address main deficiencies of, current practice. The book's methodology draws on diverse quantitative disciplines, from mathematical finance through statistics and econometrics to actuarial mathematics. Main concepts discussed include loss distributions, risk measures, and risk aggregation and allocation principles. A main theme is the need to satisfactorily address extreme outcomes and the dependence of key risk drivers. The techniques required derive from multivariate statistical analysis, financial time series modelling, copulas, and extreme value theory. A more technical chapter addresses credit derivatives. Based on courses taught to masters students and professionals, this book is a unique and fundamental reference that is set to become a standard in the field.